Needing parts to repair the station, the Chief O'Brien leads an expedition to DS9's abandoned counterpart station, Empok Nor. 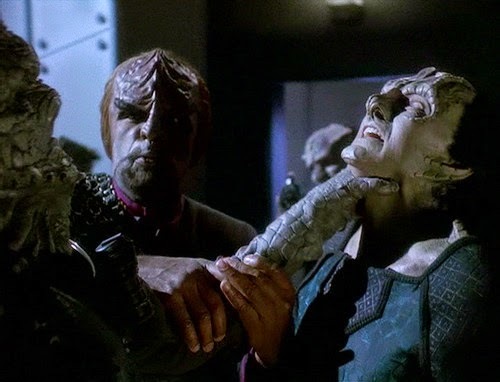 When they run afoul of some left overs from the Cardassians' time there, things turn ugly. Which of these people won't last the episode? These new uniforms make it difficult to tell. The Maquis, all but obliterated by a Dominion-replenished Cardassia, launch a final assault the form of cloaked missiles. If the missiles hit their target, it will precipitate all out war with the Dominion, to say nothing of the unthinkable number of civilian causalities. 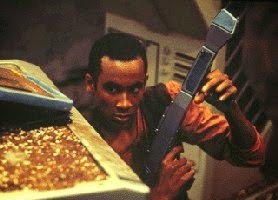 To stop them, Sisko must turn to disgraced Starfleet officer Michael Eddington. 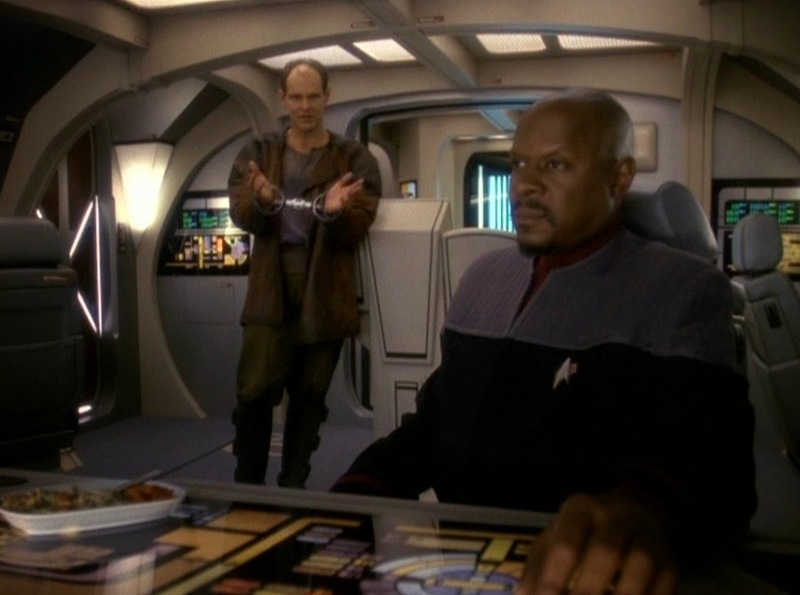 Sisko and Eddington hammer out the all-important matter of a safe word. The crew of the Defiant finds themselves trapped around a strange new world - one containing a colony of their own descendants, who have been building a life for themselves for the past 200 years. 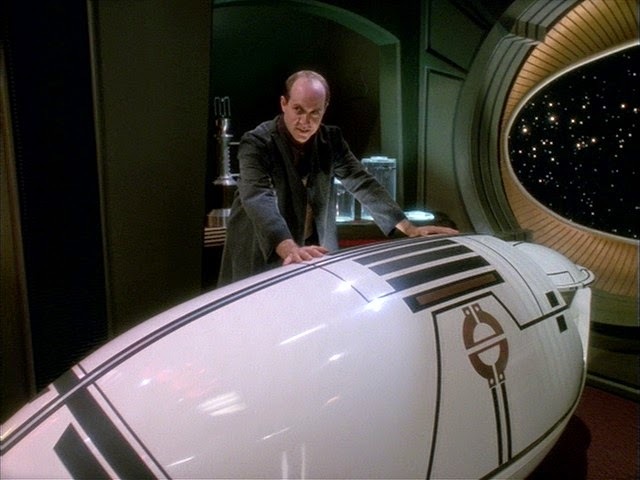 Odo demonstrated all he's learned about women in the space of 200 years - by taking one to her own gravesite. 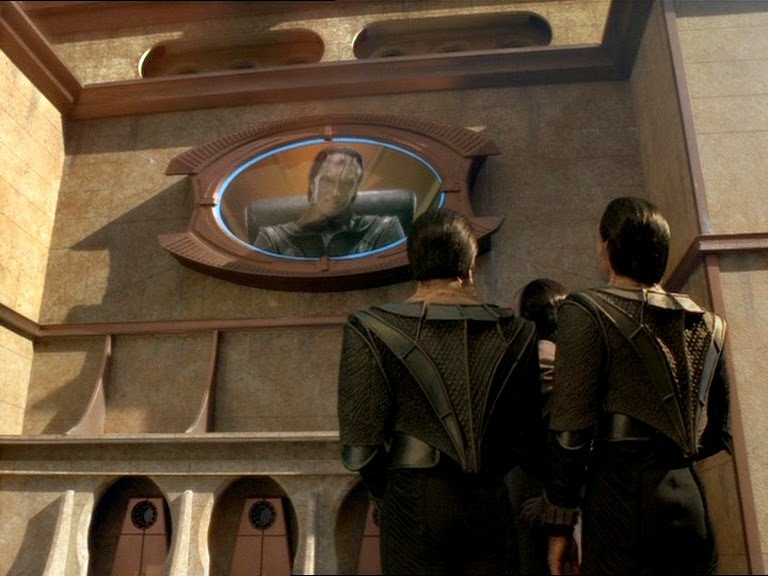 Martok is sent on a mission to locate a missing Klingon cruiser near the Cardassian border. 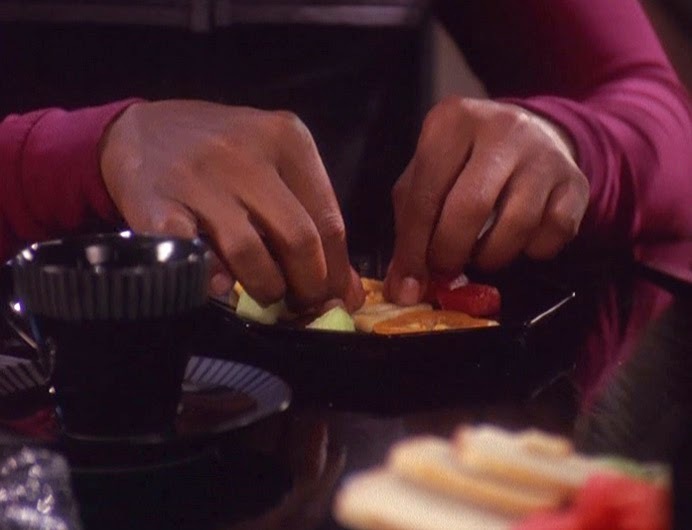 He asks Worf to serve as his first officer. 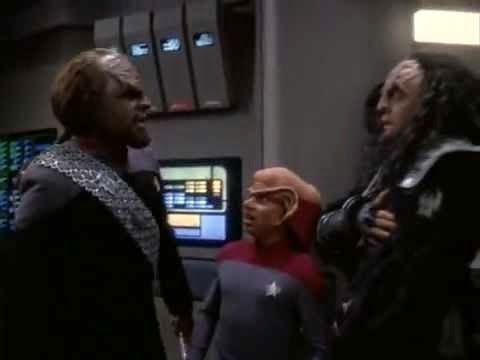 He is eager to help his friend and comrade, but soon learns that Martok may not be up to the task. 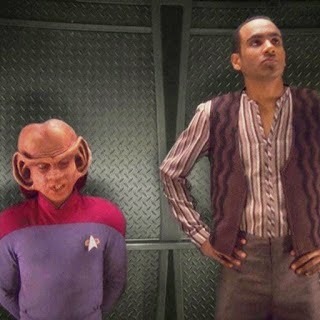 Nog hopes he's not about to be caught up in the middle of some sort of Klingon "sword fight." Quark, depressed by a vole infestation in his bar and dejected by a general sense of malaise in his life, heads home to his mother for support. When he finds her enmeshed in a love affair with the Grand Nagus, he must decide whether his fortunes or her feelings are more important. When It's Time For A Rewrite, Exhibit A: This is the best scene in your episode. 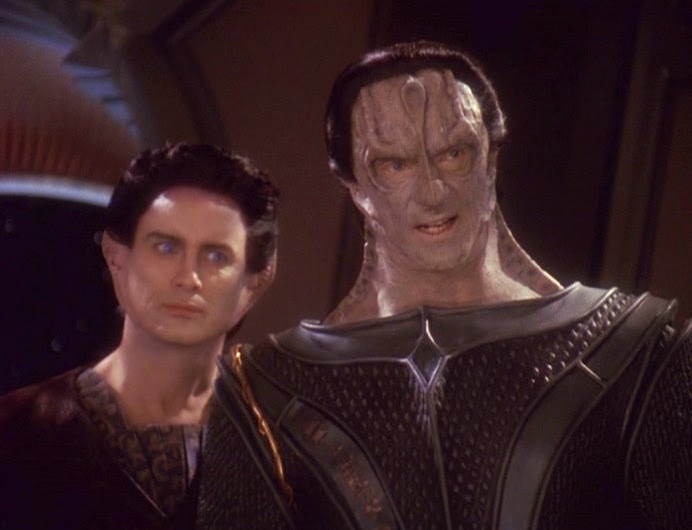 Kira's ersatz Cardassian father has returned to the station, Kira hopes to help spearhead the resistance to Dukat's new Cardassian government, but he has shocking news: he's dying. Behind every great man is a sissy Vorta. 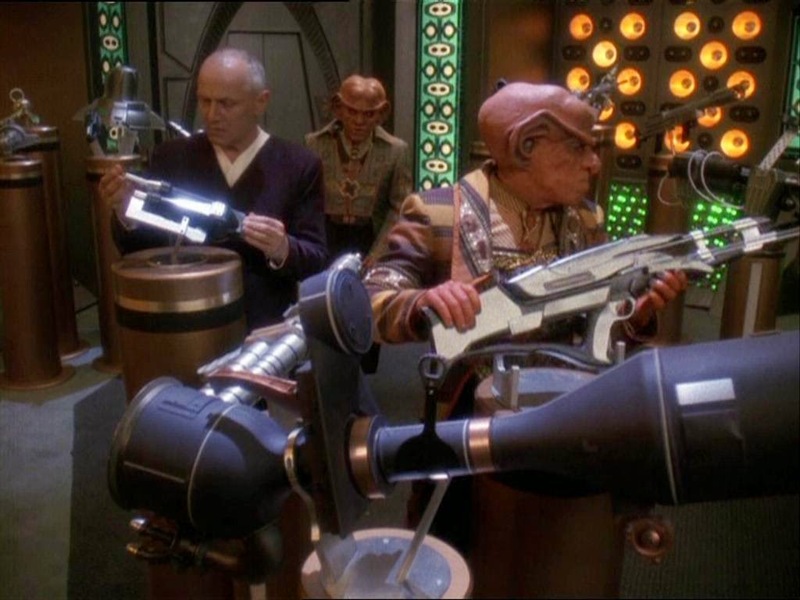 Quark finds himself in dire financial straits and is tempted to deal weapons with his cousin Gaila in order to recoup his losses. But his personal ethics are tested when a client wants to kill millions. Look at all these cool guns you'll never get to see on Star Trek! 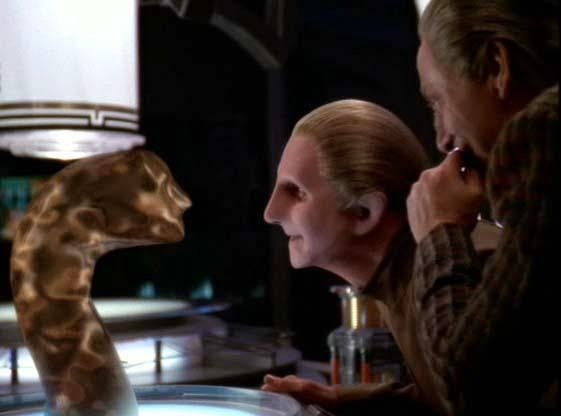 Odo investigates a murder, and falls for his prime suspect. Have I shown you the one where I pretend to be an overhead sprinkler system and shower you with pointless lights? 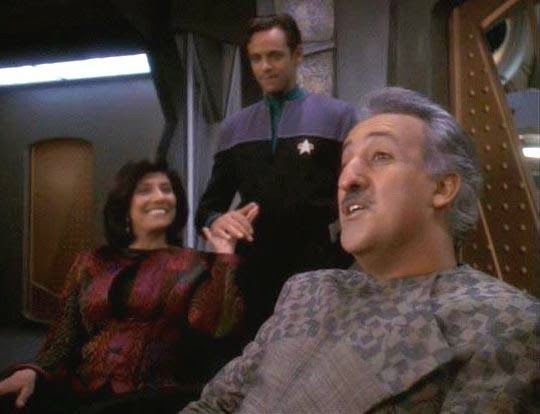 Doctor Bashir is selected as the holographic model for a new Starfleet EMH program, but the interview process involving his friends and relatives uncovers his dark secret - having been genetically engineered as a child by his parents. "I was a very bad man!" 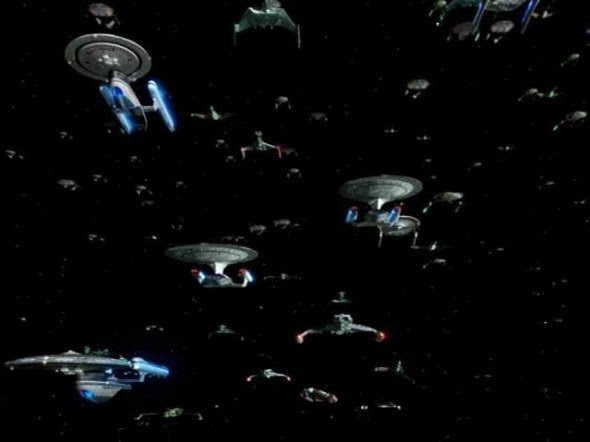 The Dominion fleet is charging through the wormhole. Worf, Garak, and Bashir are still being held by the Dominion. That's all the intro we have time for. That's how intense things are. Tune in next week! 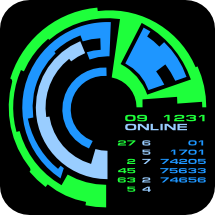 Same Dukat time, same Dukat channel! 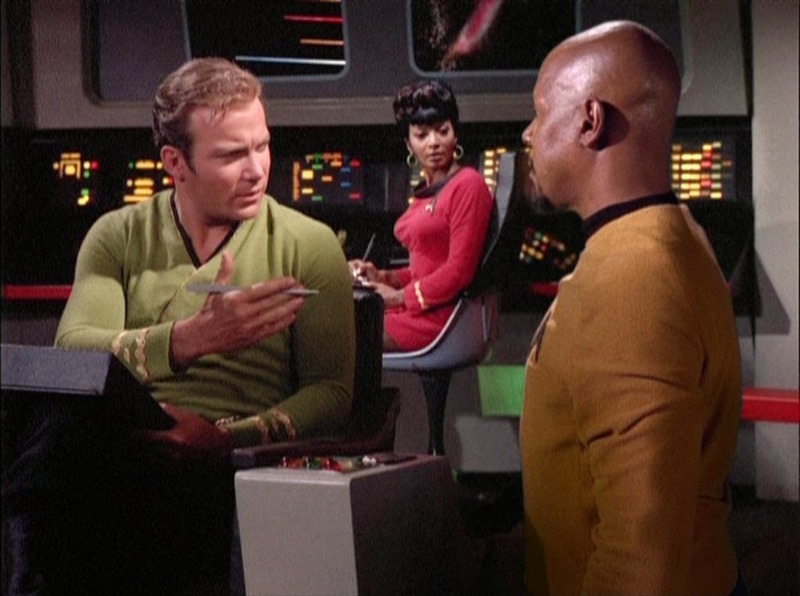 Captain Sisko risks everything in pursuit of Michael Eddington, his former security chief, who betrayed Starfleet to the Maquis. The nefarious Michael Eddington intimidates Captain Sisko with the latest Sega Genesis hardware. Major Kira finds herself and her baby placed in mortal danger when someone from her past begins killing off members of her former resistance cell. Unfortunately for us, he succeeds in killing the last two interesting Bajorans. 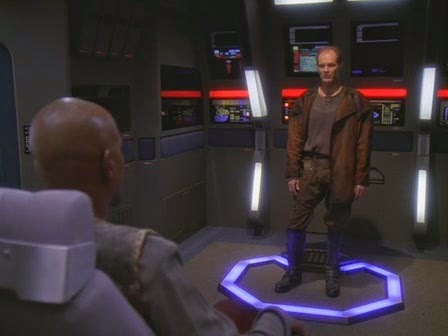 Odo and Quark become marooned an a frigid, barren world and must work together to survive long enough to be rescued. It's entirely possible that they'll kill each other before exposure or starvation even becomes an issue. Meanwhile, Jake and Nog adjust to their new status as roommates. What did the Ferengi say when the Human asked him for a strip of Latinum? Sorry, I'm a little short. 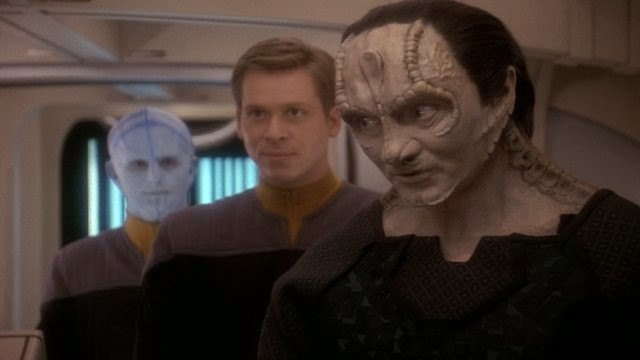 When their runabout is caught in a plasma storm, Odo, Dax, Sisko and Garak find themselves together in a strange environment - the DS9 of nearly a decade prior, known by the Cardassians as Terok Nor. Strangely, they are all viewed by the residents there as Bajorans - Bajorans accused of a capital crime. "Let He Who Is Without Sin"
Worf and Dax go on vacation. Also, Worf is apparently an enormous, possessive jerk. 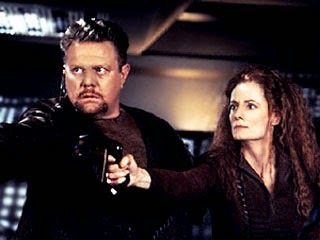 Also, sadly, unlike television, uptight fundamentalists make it into the 24th century. There. Intro finished. Ugh. When this is as wild and crazy as your pleasure planet gets, you've got some conceptual problems with your episode. 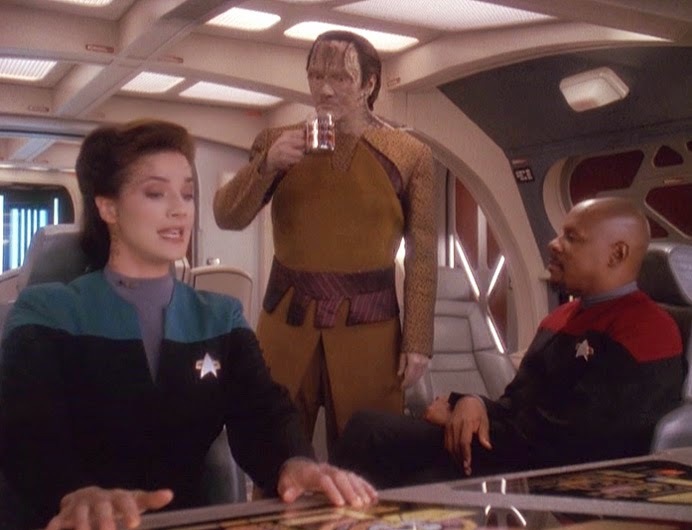 A magic plot device whisks the DS9 crew back into the past, where they discover a plot to change history, and a lot of furry creatures, to boot. Grow some hair, Space Hippie! What a Herbert. 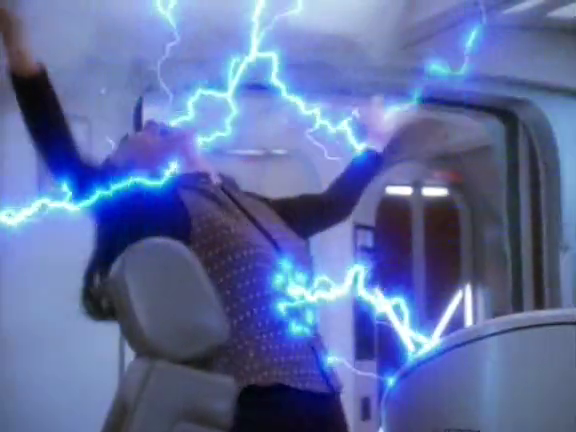 Keiko returns from a trip to Bajor, apparently possessed by an alien entity that threatens to kill her if O'Brien doesn't do exactly what she says. When Jake is waylaid by a detour into a battle zone, he thinks he will find good material for journalistic writing. He finds a lot more than that when things go south. Commando Jake! Kung Fu Grip! Go, Joe! Quark's ex-wife Grilka comes to the station looking for his help. 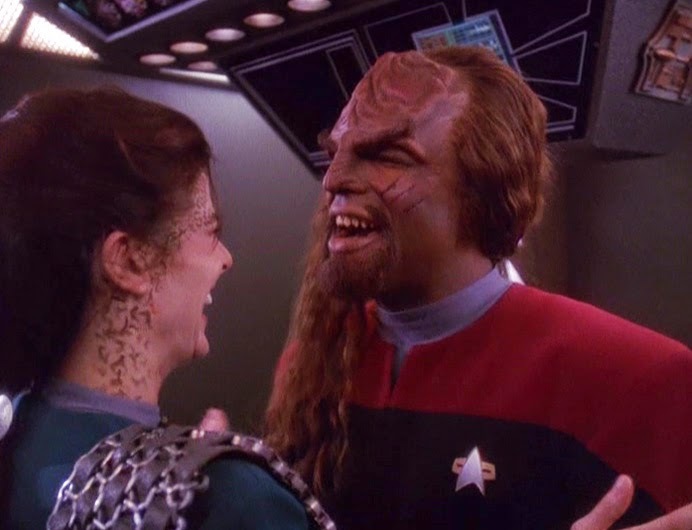 She immediately attracts the attention of Worf. Comic hijinx ensue. Meanwhile, Kira and the O'Briens continue to adjust to life together since Kira became a surrogate for their child. A crashed Jem'Hadar ship presents Sisko with a test of his ability to command his crew under the risk of death in the service of a nebulous objective.